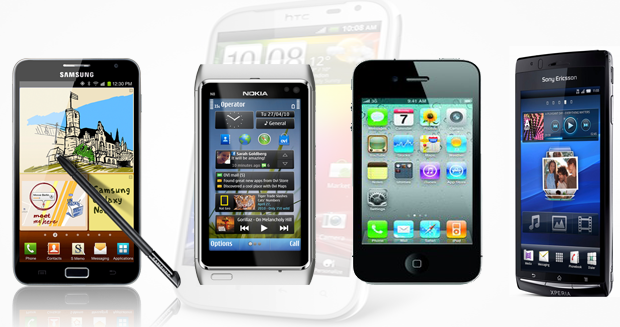 It would not be wrong if we call the pocket devices equipped with camera as the camera with the mobile capabilities. Era back, the incepted camera phones have now taken a new shape and they are more like a high mega pixel, optical zoom camera coupled with mobile functionalities. Prices were also quite high in the beginning but in last couple of years, scenario has been changed and users are facilitated with the high end camera phones in optimal price range. In the present mobile era, where companies are in neck to neck competition, prices of the camera phones even with advance features are quite comparative. In the price range of Rs. 25000 to Rs.45000 you can expect your camera phones to be enabled with advance optics, sensitive sensors and capabilities to take high mega pixel and detailed pictures. Let us have a look at the top five camera phones this December. Peddled as one of the most intelligent, fast and a device with highly interactive features, the stylish sleek iPhone 4s is truly remarkable innovation from Apple. This smart phone comes in unique stylish look with sharp and thin design just like to its predecessors. This 5th generation model is equipped with 3.5 inches display capable of showcasing the interface screen with 640X960 pixels. This display is called as Retina display which is supposed to be the highest resolution display ever installed in a smart phone. In terms of picture capturing capabilities, the smart phone has 8.0 mega pixels Camera which is supported by LED flash. The camera makes use of one of the best image sensor to produce the colour of life equivalent to the reality. The images captured are detailed and variance, the iPhone 4 s camera is also capable to record High Definition videos at 1080p and also facilitates with the functionality like touch focus and Geo Tagging. The fast dual core processor and capabilities of iOS 5 also enable the users to make easily editing and sharing of the captured snaps. There is a reason for applause for the iPhone 4 s users, as they can also make use of the iCloud services to store their snaps in the virtual space. There is a brand which is never got affect from innovation happening around; Nokia was and still is a consistent player in the smart phone world with its 12 MP enabled Nokia N8. This high end interactive unit is equipped with camera with the capabilities like Carl Zeiss optics, CCD image sensor, automatic red eye removal, Xenon flash and auto focus. The camera allows to capture snaps in high resolution as compared to any other smart phone in this segment. Empowered by Symbian Anna upgrades, it has got the capabilities to record HD videos at 720p with 30 frames/sec. It is not just camera, which is impressive in N80 but there are various other capabilities which makes it as a perfect smart phone. The 3.5 inches touch display powered by the 600 MHz processor, the device is capable to offer you excellent user experience. Among the most impressive and fastest android smart phone available in the Indian mobile mania; Galaxy note is a smart phone to talk about. The device is powered by 1.4 GHz dual core processor which is supported by 16 GB internal memory. The display is bigger than many other smart phones in this segment; with the 5.3 inches display, user will love to play with the highly interactive widgets in the phone. The picture taking capabilities is quite impressive with, 8 MP auto focus camera supported by LED flash. This makes it capable to record HD video at 1080p at 30FPS. The 5.3 inches display support better view to the captured snaps and to easily edit and share them with your peers. In the range of 38K, the Sensation is ready to bring sensation among the smart phone users. The 8 mega pixels camera equipped in HTC sensation XL enables the HTC users to take some fabulous stills and HD video clips. It is capable of recording high definition videos at 720p. The camera features also includes auto focus and manual touch focus. The camera capabilities is powered by 1.5 GHz processor and 4.7 inches display which let the user to clearly view the best angle before capturing the detailed picture. Last but not the least; Sony Ericsson Xperia Arc is last in the list (not by Rank). Although the Arc was better in terms of picture capturing capabilities than Arc S, but still the upgraded version also offers exceptional picture quality. Sony as we all know is among the best to offer high end digital camera and in the case of Xperia Arc, both the companies have utilise this competency. The 8.1 MP Camera equipped in Xperia is capable to capture detailed images and HD videos at 720p even in low light conditions. The image quality is impressive and you would love to be an Xperia user. The device is powered by 1 GHz processor and 4.2 inches touch display, other capabilities include 512MB RAM, and 364MB ROM. The Auto focus capability with along with the option of touch focus makes this camera phone quite impressive for smart generation. You can even select smile detection option to capture the perfect shots. So, which one you gonna by this session! I hope you might have made your mind to buy one. Do let us know which one has impressed you the most this year in comments section below ! Norton Internet Security 2012 Hands On Review - Protection With Performance!